In this review, we here at Review2Sound are going to take a look into this product by Jim McCarthy. 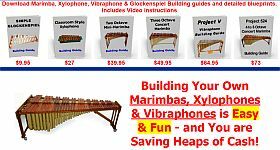 Make A Marimba is a step-by-step plan and video package which features how to make marimbas, vibraphones and xylophones. This is a fun and easy product of Jim McCarthy. You can have a broad range of pro mallet instruments and still have extra money to spare. If you can’t afford any commercial instrument, Make A Marimba gives you an alternative solution. This is also a way for a percussion student to have an affordable practice instrument at home. Make A Marimba can be a real fun project to make for percussion players. This is also a good start for high school students to learn and love music early on. Jim is a master percussionist for more than 20 years now. It is his passion to build and design marimbas, particularly for other people. Despite his skills, he never considered himself as a pro woodworker or trader. He builds these projects because he is a musician, and he can easily make those instruments. With his Make A Marimba, you can easily do it as well. You are no longer required to do any planning, designing and hard work. Jim got into acoustics when he had taken his master’s degree. He learned everything related to building marimbas. Out of his hobby, he made some world record bass marimbas. 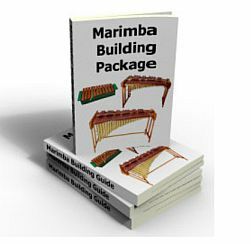 Make A Marimba Features Overview. Permits usage of inexpensive materials. All plans include metric and imperial measurements. It does not need any woodworking skills. No need for expensive tools. Make home-made instruments and sound commercial-like. Jim’s goals these days are more practical, and it’s evident with his Make A Marimba. He designs instruments for you and helps you save more money. He also builds other instruments like ultra large bass marimbas and small xylophones. The great thing about the Make A Marimba projects is that you can use any type of wood available. If you want to make glockenspiel and vibraphone, it is better for you to use standard metal stock. Even without using African padouk or Honduras Rosewood, you can still make concert-quality marimbas. With the help of Make A Marimba, you can make these high-quality instruments using any hardwood. If you have decided on using the Make A Marimba package, you can have instant access to videos and e-books by downloading these. You can get started instantly. The Make A Marimba print out is in Adobe Acrobat Reader form. The Simple Glockenspiel Building Guide. The Box Resonated Xylophone E-Book Plans. The Two Octave Mini Marimba Plans. The P3 Three Octave Marimba Plans. The P524 Pro Concert Marimba Plans. The Three Octave Pro Vibraphone Plans. Mallet Making Guide e-book and video (free). One-Month Subscription to Percussion Keys Website (free). I hope we helped you have a quick look at what Make A Marimba can offer you in this review.